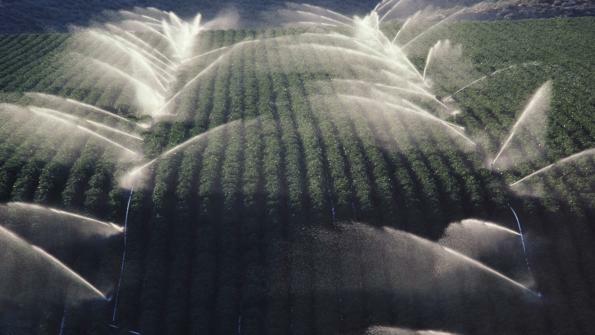 Groundwater depletion is threatening the sustainability of the American west. Extreme drought conditions in California have been depleting groundwater reserves at a rate that could challenge long-term water supplies for the region. A new study released late last month quantified exactly how much groundwater people have been using during the drought, and Stephanie Castle, the study's lead author and a water resource specialist at the University of California, called the depletion "shocking," according to the Associated Press. "We didn't realize the magnitude of how much water we actually depleted,” she added. The study found that since 2004 the Colorado River basin has lost 53 million acre feet, or 17 trillion gallons, of water. Unlike reservoirs and other above-ground sources of water, groundwater can become depleted to the point that it will never fully recover, Castle said. Current usage rates, she told Stanford University’s news service, could jeopardize the resource’s availability in the future. The Colorado River basin supplies water to about 40 million people and 4 million acres of farmland in seven states: California, Arizona, Colorado, New Mexico, Nevada, Utah and Wyoming, the AP reports. "Combined with declining snowpack and population growth, this will likely threaten the long-term ability of the basin to meet its water-allocation commitments to the seven basin states and to Mexico," Jay Famiglietti, a senior author on the study and senior water-cycle specialist at NASA's Jet Propulsion Laboratory, said in a statement. Water has increasingly become a concern in the minds of California residents. For the first time since 2000, water has overtaken air pollution as the top environmental issue in the minds of Californians, The Washington Post reports. A survey, released by the Public Policy Institute of California, found that 35 percent of Californians felt the state’s water supply was the biggest environmental concern. This is up 8 percent from three years ago. To curb the problem, California Governor Jerry Brown singed a bill last month to prevent homeowners associations from enforcing requirements that lawns be kept green, The Washington Post reports. This is on top of statewide watering bans and other conservation efforts.